Python is an excellent programming language that has rapidly become popular among Hackers, Reverse engineers, software testers, Forensic analyst and Penetration testers. Python is a simple object-oriented and minimalistic language that is easy to learn for novice programmers as well as experienced developers. Most Python programs run on all major operating systems including Windows, Linux, Mac, etc. What makes Python such an effective platform for Security Professional and Hackers? Python supports pre-built extensive libraries that are specifically designed for penetration testing and provide some powerful functionalities. So if you are looking for a most widely used and easy to learn scripting language, go for Python. Here I'm introducing you a Free IT training from Cybrary – Python for Security Professionals. There is nothing wrong if I say that scripting languages like BASH, Perl, and Ruby can not do the same things as Python, but building those capabilities are possible and much easier using Python. How to apply the functions of Python to penetration testing, security research and attack automation without knowing the complete programming language. You'll learn about networking protocols, fuzzing, and information gathering automation in a simple and easy-to-understand format. However, there are certain commands and functions that are critical to becoming a top-tier professional. Python for Security Professionals program is designed specifically for beginners, i.e. for non-coders, who are curious to learn this critical scripting language for their successful career in penetration testing and cyber security. Focusing on networking and security, this free course will take you from basic Python concepts to advanced Python scripts in just about 10 hours of video training material. It contains plenty of examples and introductory material. 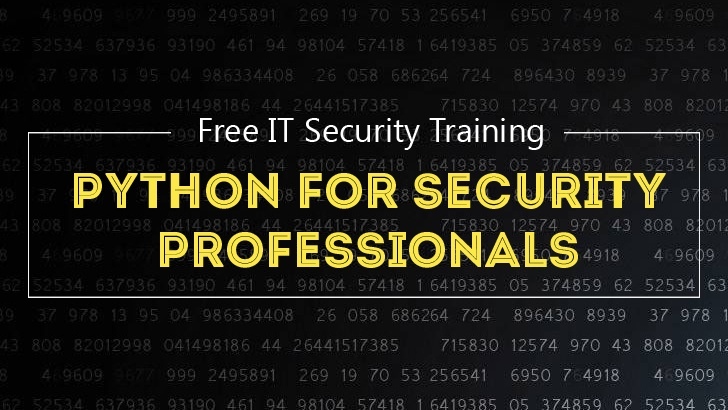 To get the full benefit, you should jump in, Join free Python for Security Professionals training and follow the examples step by step.